Description: U.S. Surveyors surveying Sedgwick County, Kansas. Chief surveyor Samuel Smoot at right center, identified by a small x beneath his image. 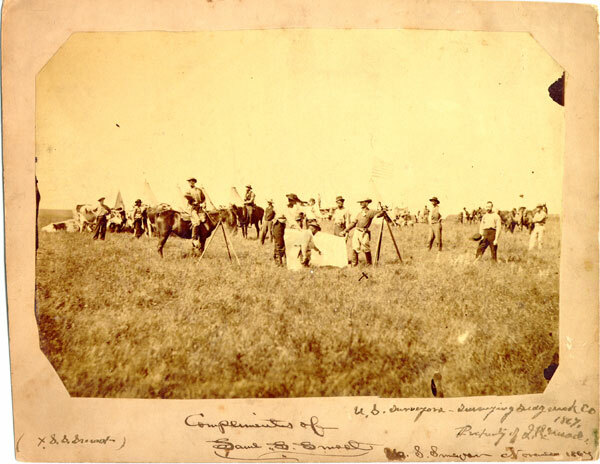 Keywords: Wichita, government, people, surveyors, surveying, Samuel S. Smoot, Sedgwick County, tents, horses, cattle. 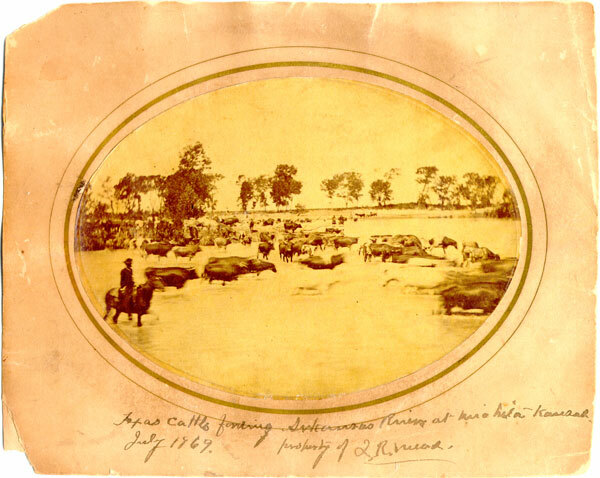 Keywords: Wichita, rivers, people, livestock, cowboys, horses. Description: View of Main Street in Wichita, looking north from Douglas Avenue. 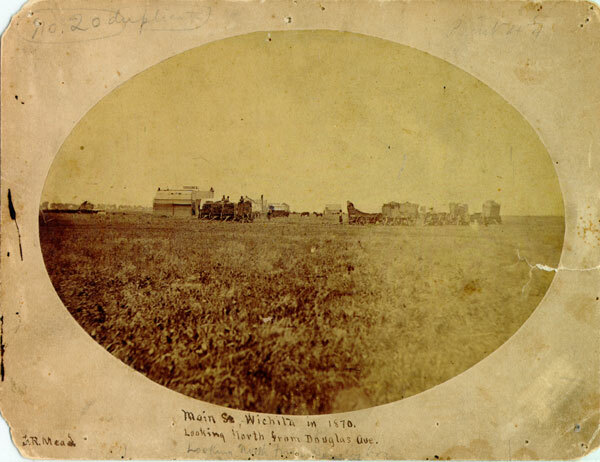 Keywords: Wichita, street scenes, people, transportation, business and industry, stores, covered wagons, wagons, horses. 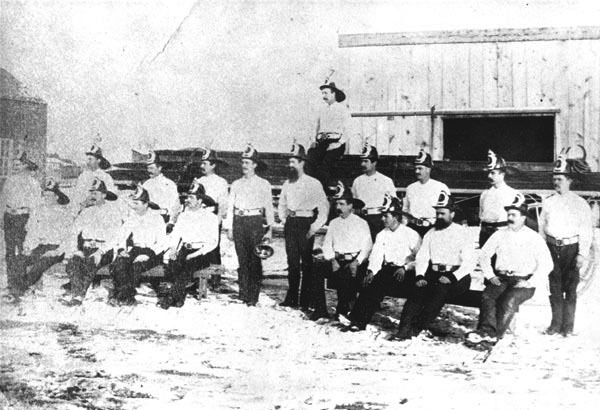 Description: Frontier Fire Company shortly after it was organized. Keywords: Organizations, clubs, and groups, people, public services. Description: Wichita & Southwestern Train. 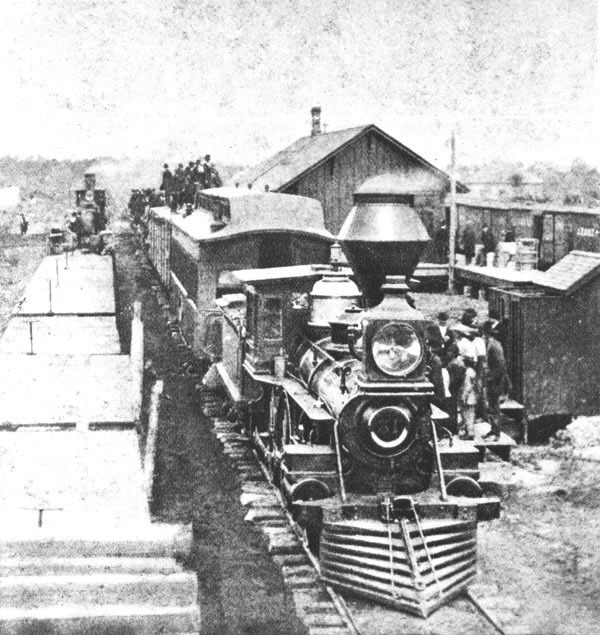 This was one of the early trains that came in from Newton, Kansas. Keywords: Transportation, depot, people, engine. 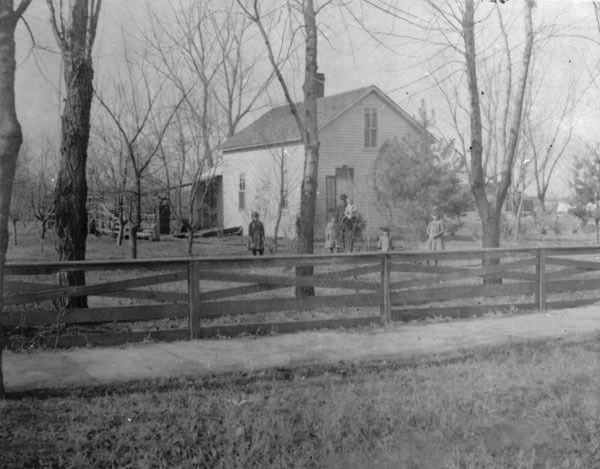 Description: Residence of James R. Mead, 307 East Central. Keywords: Residences, people, mansard roof. 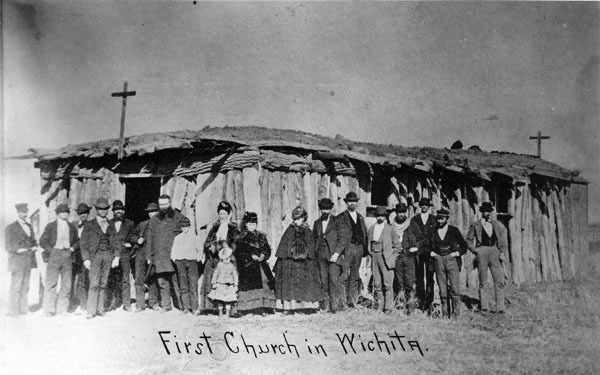 Description: Wichita citizens posed in front of church building in Wichita, built around 1870 and used by the Protestant Episcopal Church, now St. John's Episcopal Church. The location was north of Third Street on east side of Main Street. Keywords: Wichita, religion, people, churches, St. John's Episcopal Church, architecture. 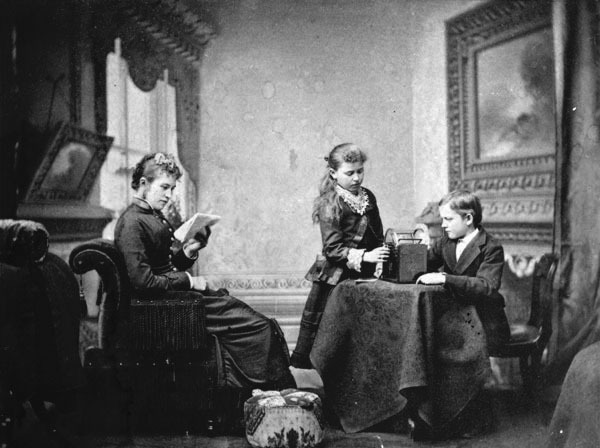 Description: Mrs. Mathilde Baldwin with children Fred and Moscaline. The children are operating a carousel-device for viewing photographs. 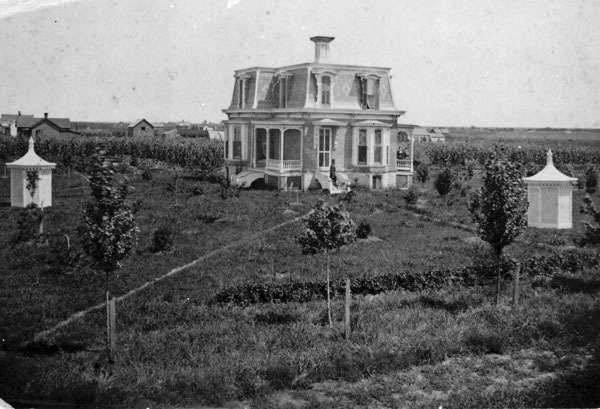 Nereus Baldwin was a prominent photographer in early Wichita. Keywords: Business and industry, photography, people, domestic scene, residences, interior, sports and recreation. Description: Residence of J. C. Fraker at 306 East Central Avenue. Second Empire style features mansard roof. 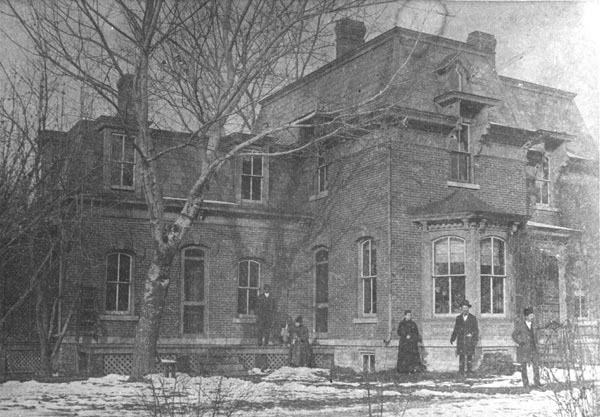 The Fraker family is seen posed with the house. By 1896 it was occupied by the Samuel Houck family, owners of Houck Hardware Company. Keywords: People, business and industry, architecture, landscape, Wichita.